The ‘My Pictures’ feature of Microsoft Windows Media Center Edition is probably the most used feature in our household. We have tons of digital photos and have started scanning in most of our slides. Often while viewing a slide show with friends they will ask where particular photos were taken. With a combination of geocoded digital images and MSN’s Virtual Earth web based map control it is now possible to show them on a map right inside Media Center. 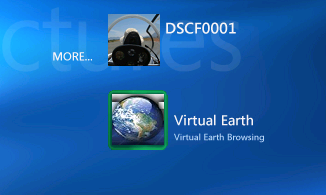 A secondary use for Virtual Earth within Media Center is to use it as a digital atlas for browsing the world. I wish I have a Media Center Edition PC to try this on. I think it would be really cool to see something on the TV and want a map of its location. How long to we see geocoding of video feeds? This isn’t polished yet, but I see a huge market to mapping on a TV. Why let CNN or MSNBC have all the fun on your TV?